This recipe was meant to be last nights dinner. I had it all planned out and had even cut up the onion, opened the tin of salmon and sliced the tomato when I realised that I only had one egg left. Fail. So into the fridge all the ingredients went and out came frozen left overs from last week. At least this meant that when I went to cook lunch today everything was nicely prepped for me. 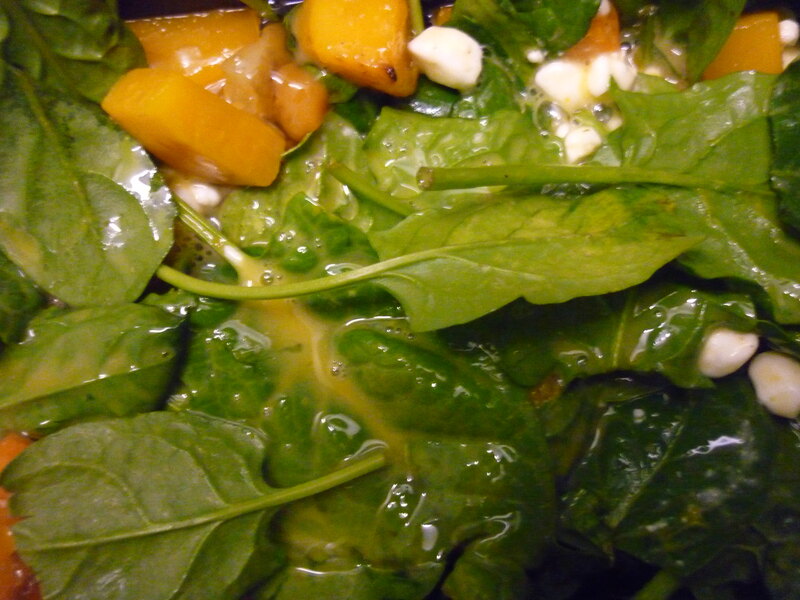 This quick recipe was another recipe inspired by the random items left over before grocery shopping day. 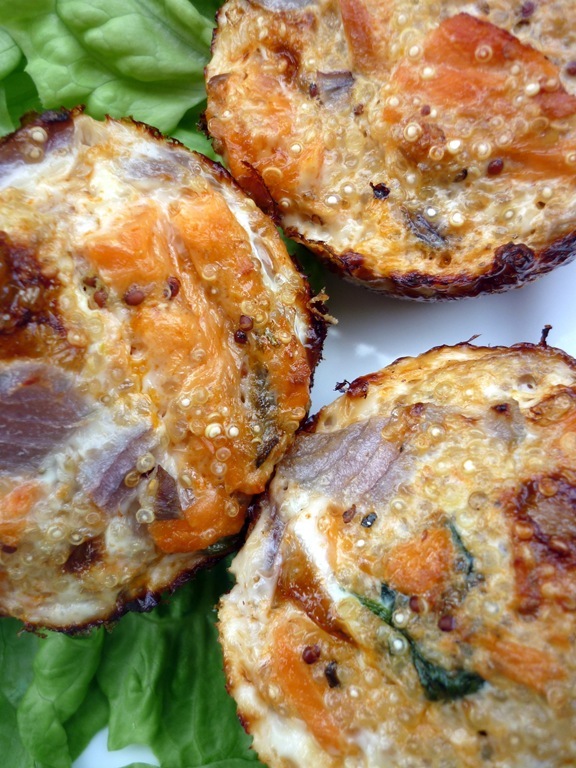 The little salmon quinoa cakes are baked in a muffin pan. The quinoa helps add a little crunch to the outer shell of the cake and prevents them from being watery. If you don’t mind spending a little extra, use red salmon instead of pink. I think the taste is far nicer. 5. Stir gently to combine. I tried to keep small hunks of salmon instead of making it into a paste but it’s up to what texture you prefer. I served my salmon quinoa cakes with tomatoes roasted in balsamic vinegar, rosemary and olive oil, on top of some iceberg lettuce leaves. This was the perfect fast, high-protein lunch after a heavy morning gym session. 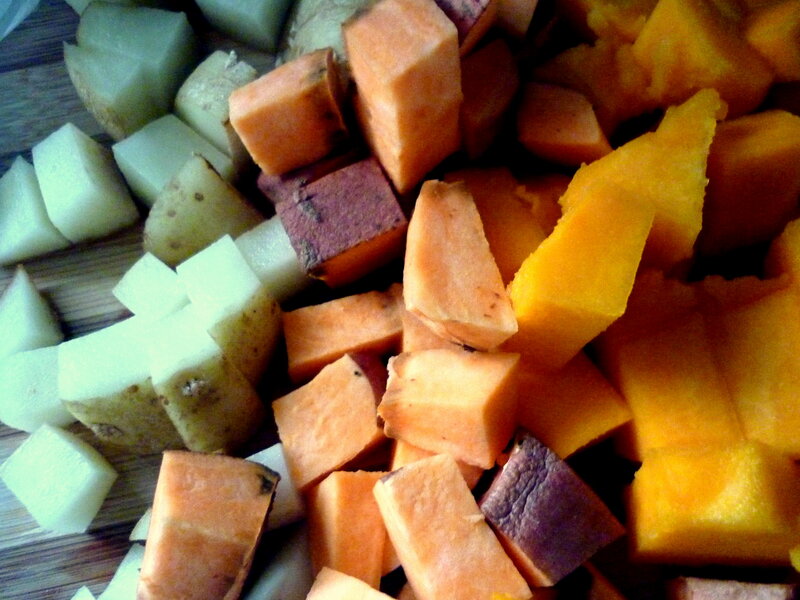 If I could post smells instead of pictures on this blog, then today it would be the smell of these vegetables cooking. 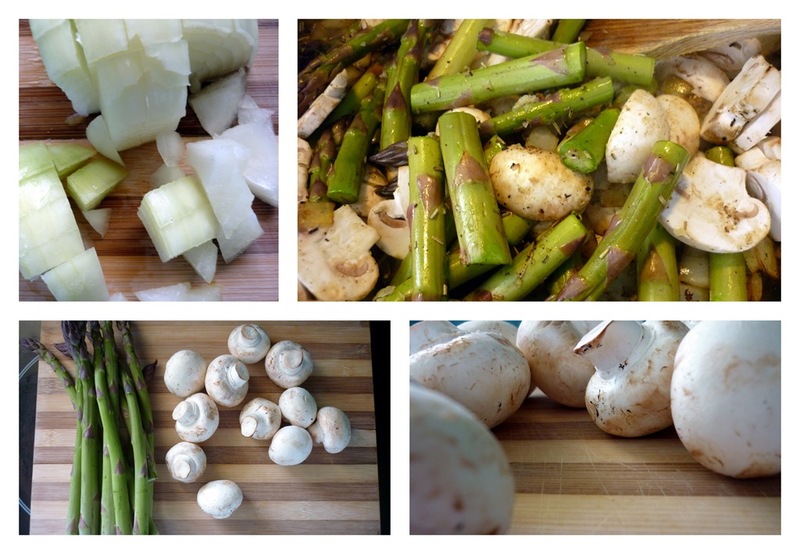 The asparagus, onion, mushrooms cooking in olive oil, rosemary, garlic and lemon juice were fragrant and made the kitchen smell incredible. 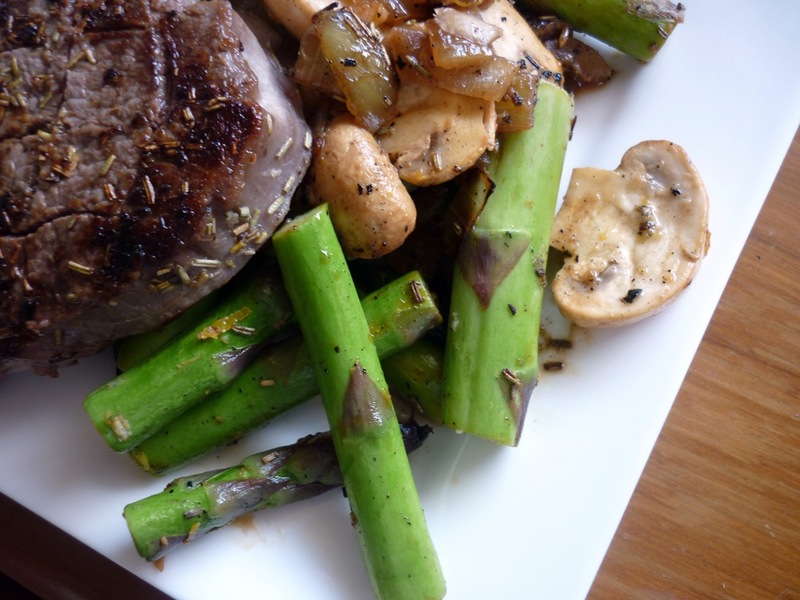 Asparagus being back made me a happy grocery shopper this morning and I had to try it out in this South Beach recipe for Beef with Asparagus and Mushrooms. I’m no fan of the South Beach diet – I’m too much of a carbohydrate lover to follow it but I have found that the website has some really, really delicious, nutrient packed meal ideas. This dish is very simple – pan-fried steak and sautéed vegetables. The addition of garlic, rosemary and especially the lemon zest takes it from being potentially boring to something to get excited about (unless I’m the only one who gets excited about a good feed?!). I’ve re-written the recipe here in metric measurements and for 2 portions instead of 4. 4. Cover the meat with foil while preparing the vegetables. If you’re like me and get grumpy with-out some carbs or you’re hungry I’d recommend serving this with some boiled baby potatoes. Mm. For dinner tonight I wanted to make something light, healthy and use up the withering vegetables in my fridge and cupboard. At the start of the week I realised I had somehow managed to accumulate 3 cartons of eggs so, a frittata it was. 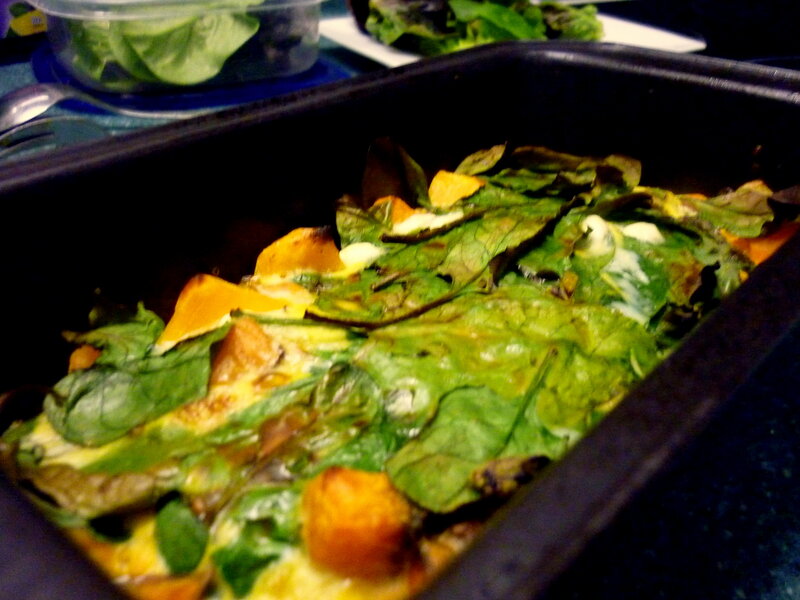 Inspired by the Healthy Food Guide recipe for Potato and Spinach Tortilla I put together the following dish. I served this easy meal with some crisp cos leaves, some cottage cheese and a teaspoon of chutney. Not the most attractive looking dish but it tasted good.